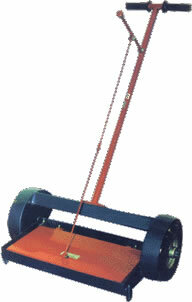 Easy to operate and quickly cleans floor of scattered iron particles. Magnet housing with powerful Strontium Ferrite magnets. Supported on rubber wheels on ball bearing for long life. Very useful in machine shop. Cost effective in packing department to retrieve costly raw materials like nuts/bolts/balls/bearings etc. Prevents damage to shoes and avoids accidents.